When I was growing up in Chicago in the 1950’s, there was a popular song called ‘He’s Got the Whole World in Hands’. Back then as a little girl, it was comforting to know that Someone was taking care of everything, even though it seemed to me that there were a lot of problems that were getting overlooked. Now as an adult, I can see that each of us has to step up to the responsibility of creating a world that works for all of us. And, there’s much to do. I have a collection of people who I think about pretty much on a daily basis and send them healing energy. They are in strife regarding their mental, physical or emotional health and suffer from conditions like prostate cancer, Alzheimer’s, terminal skin disease, gout, chronic fatigue, diabetes, Parkinson’s, anxiety, and even poverty. As I get older I’m noticing that more and more of my contemporaries are encountering the diseases and deterioration of ageing. At the moment, I’m in a state of total well-being (if you don’t wrinkles and excess skin), but I don’t take it at all for granted. I am fortunate and I think in terms of how I can support others. 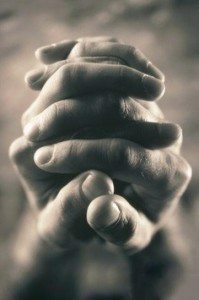 Those of you who have a regular meditation or prayer practice have a unique opportunity to consider others in distress and offer them your goodwill. Many yogis, when they do yoga, create an intention , known as a sankulpa in Sanskrit. They state at the beginning and close of their practice anything they want to affirm in their lives and this is the time to send out love to individuals or to the planet. This week you might want to consider a special opportunity to offer your practices through setting an intention to help a community of spirited women and children in the Tansa Valley, India. We who are more fortunate in the West can support these indigenous women in improving their local health programs and becoming better educated. Their goal is to reduce infant mortality. The organisation coordinating this initiative in Australia is called PRASAD. 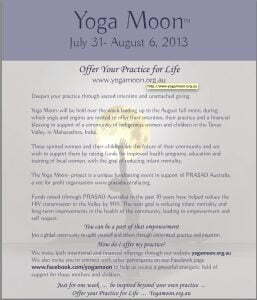 Please check out their website and the umbrella organisation The Yoga MoonTM.